Hi everyone, Battle for Lordaeron scenario for the BFA expansion is now live, you can find the guide for it along with the complete 110-120 leveling guides in the leveling guides section of the addon right now. Subscribers and Loyalty Program members just need to make sure they update to the latest 8.621 now with the installer. Our Battle For Azeroth Update introduce 6 new massive leveling zones over 2 continents. Zandalar for Horde and Kul’Tiras for Alliance. A lot more than 4 leveling zone for Legion on release. The “The War Campaign” guide will guide you to quest in the opposing faction continent and will also require more updates as Blizzard will likely add more content with new patches, similar to the Class Campaign guide for Legion. The updates for this expansion have been quite challenging for us because of a large number of changes to map system and due to many quest changes as the Beta progress forced us to redo the leveling guides multiple times. 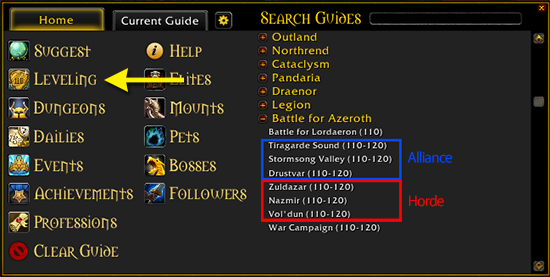 You can use the 110-120 leveling right now if you have access to BFA Beta servers and we would appreciate any feedback to make the leveling guide as smooth as possible on BFA launch day. 44 replies to "BFA 110-120 Leveling Guides Available Now"
its been a long time since I ordered the first guide parts of your program, still loving it. Today I got your bfa part thanks for it. You working on a professions part to I think? waiting to see it arive. I seem to have gotten some of the guides, but not all of them. For example, I don’t seem to have ‘Wide World of Quests’ guide. Have used for several of my alts.. fastest way to lvl using both quests and dungeons. Since I am perpetually confused, I cant seem to get my quest log to work. I need to delete some quests and uncompleted dungeons but cannot access them to do so. Can we at least get an acknowledgment that BFA seems to be broke for some loyalty members? there seems to be a memory leak, after playing for an extended period of time my fps will drop from 70 to 5 or less. When I look at the memory usage and Dugi Guide is at the top of the list and counting up and up and up. requires me to shut wow down and restart. This is an issue with old macros, please delete all your macros and re-add them if necessary and it should fix the FPS issue. My leveling pack has disappeared also. When will this be fixed? You can add me to the list of loyalty members who had the BFA guides, but they are no longer showing up after the update. I have re-reinstalled and used the repair button. Where is my leveling pack??? Ordered my Swiftpoint, I’m 73 so hoping this mouse will help me take out more of these horde characters. I play on the Hoard side, I haven’t had this problem. I was on last night (EST) and again this morning. Might want to check other addons that updated overnight.